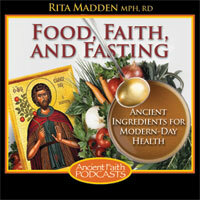 Welcome to another session of Food, Faith, and Fasting. It’s great to be together again. And today, believe it or not, we are going to still focus on the area of portion control. The reason that we have to stay here a bit longer is because of the teachings that we have from the wisdom of the saints. When we tire our bodies from eating too much, our soul also weakens. We have mentioned this teaching of St. Seraphim of Sarov quite often in the past few sessions that we’ve had together, but the main point of this teaching is that eating too much does have an ill effect on our soul and also on our body. And what do we know from the teachings of St. Gregory Palamas? Man, as God’s image, is body and soul alike. So there is a very important component and concept about eating too much—lack of portion control—that we need to address, because, yes, it is harmful to our spiritual life, but in the same aspect, it’s harmful to our physical bodies which we also do need to care for, so that body and soul can work together to ascend towards the divine. So when we focus on portion control and eating a sensible amount for our body’s needs, we see so many things come into healthy range: blood sugar, blood pressure, cholesterol. I’ve even seen people get off gastric reflux medication as a result of slowing down their eating pace. And we know that slowing down the eating pace is very, very relevant to portion control. Sensible weight loss is going to occur through portion control. Today what I want to do is focus on eating in the work environment. If you currently aren’t working or you’re going to school or you’re staying at home—whatever your situation might be—I think you’re going to still find some relevant points out of this lecture, but I did think we needed to attribute a specific podcast just to eating in the work environment, because so many of us are eating in our work environment on a daily basis. And the reality of it is is that this portion control lecture, and the ones that we’re going to have in the future and the ones in the past, all are very relevant because we need to be handling portions every time we eat, and we know we’re eating in so many different locations in this day and age. We’re eating at Auntie Mary’s house, we’re eating at the restaurant, we’re eating at the mall, we’re eating at work, we’re eating in our own home, we’re eating at a party, at a picnic, at church—it’s everywhere. But every time we sit down to eat, we need to make sure that this act of eating is an act that does glorify God. Let’s focus on eating in the work environment, and see if we can come up with some strategies to help us apply sensible proportions in this sort of context. First thing I want you to keep in mind is that, like we have mentioned in the past, it’s always, always, always important to focus on eating the real foods. So the best way to do this, as much as possible in your work environment, is to focus on bringing your work to lunch with you. Whether it’s breakfast, lunch, or dinner—whatever meal you eat in your work environment—take it with you. If you’re making it at home, if you’re putting it together at home, you know what has gone into it. You don’t have to play the guessing game of “Is this a fake ingredient or not?” You have made it in the home environment: take it to work with you. That’s always a good thing to keep in mind. Also, it’s always helpful because you can also control the amount you take with you. Next session, we’re going to focus on eating in the restaurant and the party environment and things of that nature, but we’re really going to focus on eating out, outside the home, specifically in a restaurant, so I’ll give you some strategies for that next time we meet, but for this time, focus as much as possible on trying to take your meals with you to work or school or wherever you have to go, for that matter, that you have to have your meal. Find a friend to eat with. If this is an option for you, try to do it as much as possible. Move away from the workstation. Create a break in your day and enjoy that meal with your friend. Talk to your friend. Have good conversation. While you’re talking to your friend, put the fork down. After you’ve finished the food in your mouth, pick up the fork again. Focus on a way to kind of create that kind of break in the day as much as possible. My current work environment has me, a lot of times, eating by myself, and, again, trying instead of having a friend to eat with, I have some spiritual reading material, and that becomes my friend. I take an eating break. I’ll put down my chopsticks or whatever I’m eating with, and I will enjoy reading for a bit, pick up the chopsticks again, enjoy the rest of my food. Try that as much as possible. So eating with a friend or making some good reading material be your friend for that meal, this will help to slow down the eating pace. When you slow down the eating pace, you can listen to your body and know when that over-the-edge bite is going to be the next bite. Back to the teaching of St. John Chrysostom: Eat just enough to alleviate hunger. We want to walk away from the table, not feeling completely underly satisfied or overly satisfied. Try that as much as possible. Sit down when eating. If this is a possibility for you, try to do that. It will help in making the act of eating more mindful. If you only have a certain amount of time to eat your meal, specifically on your break, don’t try to finish all your food in that certain amount of time if you are able to take a little bit of it back to your workstation. If that’s a possibility for you, do that; try to lengthen that meal as much as possible. So maybe on your actual “break,” have your soup, and maybe see if you can take the sandwich back to your desk. Again, we all have different work situations, and this might not be pertinent to all of us, but I did want to try to just give some suggestions in general. If you have to eat in front of the computer, if you don’t have the option of walking away from the computer or your workstation when you do have to eat, see if you can try to at least clear the space a bit: move the papers, move the clutter. I often, when I have to eat by my computer, I put a place-mat out and actually have a napkin with me. So that kind of helps me to recognize: Okay, this act of eating is a very important act. It can be a very spiritual act. It should be something that I’m doing in a proper context—so that place mat does help me. Another thing I try to do is I try to keep my food on the side of my computer that is my non-dominant hand. So I type for a bit, take a break, have a bite of food. I try not to let that fork become a shovel when I’m maybe trying to type with one hand or surf the internet with the other hand. Be very conscientious about your decisions, and recognize that if you are going to have that brownie that Susan made, it still needs to be in its proper context. It’s not a breakfast, right? It’s not something that’s going to begin your lunch, but how can that brownie that she made fit in its proper context? Maybe you’ll take a piece of the brownie, take it back to your workstation, and focus on saying, “This is a little treat that I will enjoy after my lunch is complete. So you finish your lunch around 1:00; maybe around 1:30 or 2:00, you have this special treat that kind of ended your meal. So it’s not about deprivation. It’s about placing foods in their proper context and enjoying them in the proper way. If you go back to thinking about what we were mentioning earlier, if you practice the act of sitting down as much as possible when eating, that kind of removes you from walking into the break room, popping a brownie into your mouth, gobbling it up before you’re even to your workstation, and not necessarily honoring that sort of special treat that the person made. They made this wonderful treat to share with us. We need to eat it in a way that, again, can be an act of glorifying God—but at the same time, what are we doing? We’re really thanking them for it. We’re actually taking the time to enjoy it; we’re actually tasting it. Think about just those little strategies. Another thing to think about—and this is a very common one, and I hear a lot of people talking about this all the time: Co-worker Bob. He has a candy dish on his desk, and every time I walk to the photocopy machine, those candies start talking to me. They start developing voices, and I grab one on the way to the copy machine, I get one on the way back from the copy machine, and before I know it, five candies later, I’m really wishing I didn’t have any of those candies at all. Something you might want to do is talk to Bob and say, “Hey, Bob, I need you to help limit me to one of your candies out of your dish a day. Thank you for bringing them to work, but I do need your help with that strategy.” You might also start to recognize that you need to find a different way to make it to the photocopy machine. When we talk about this aspect of things that could be tempting to us, we have to recognize that it is important for us to set up a plan to move away from the temptation. For example, if we’ve kind of realized that we have maybe been a little bit gluttonous in our acts of just eating candy—what is gluttony? When we really need to define that—could it be just mindlessly continuing to pop these chocolates in our mouth on our way to the copy machine? Well, to a certain extent, yes. We’re doing something with the food that really is not what it was intended to have done with it. So remember, St. Maximus the Confessor gives us the teachings: Food is not bad. It’s what we do with the foods that make it bad. Again, it’s almost as if we can go into a state of repentance there. Recognize that we are, essentially, having some sort of abuse occurring to this food. Now, I’m using this example of this candy dish because it is a pretty common one, and it can be a great teaching strategy for us in many other different aspects of our lives. So we handle that sort of candy-dish routine through creating a scenario for ourselves to not fall into the same sin. When we talk about the act of repentance and the blessing of being able to celebrate the sacrament of confession, we recognize that we need to turn away from the sin; we want to completely spit it out. So that is going to have us set up a plan to not fall into that path again. Think about this candy dish example, and think about where you can take it to other aspects of your life. Many times people say to me, “I come home from work and I’m just ready to eat, and I will just mindlessly eat at the counter.” In future lectures to come, we will focus on these specific scenarios, but this candy-dish mentality can be applied to that home scenario. For this week, really try to focus on the different strategies that we’re mentioning. Remind yourself that eating is an act that we should [do to] be glorifying God. Remind yourself that taking care of the body is important as it is an aid for the soul, and body and soul alike are elevating towards the divine. And recognize that portion control and proper consumption of food and placing foods in their proper context, whether it’s in your work environment, your home environment, at a party, at school—wherever it might be—is a very important thing to do. Proper portion control is more than just at the meal. Just a quick review of the different things to focus on after this session and until we meet again are things such as taking your meal, as much as possible, to work. Try to eat with a friend as much as possible. Sit down when eating. Try to lengthen your meal and eat it in a timely fashion: try not to finish it all in fifteen minutes if that’s all you have, if you are able to lengthen it. Clear up your workstation a bit if you do have to eat at your actual workstation; try to make it special as much as possible. And focus on recognizing triggers in your work environment, whether it be that candy dish or whether it be a nice treat being delivered to the break room. And figure out how to make that act of eating that specific treat more mindful. Create a scenario, if it’s something that’s tripping you up. I hope this was a beneficial lecture, again, for you in your work environment or any other aspect of your eating life, I guess I should say. And until next time, focus on continuing to allow the teachings of our holy Church Fathers and saints [to] resonate in you, to help you in guiding your acts of eating to be a spiritually minded act.